For the second Beggars Opera effort the line-up received some sort of refreshment.Virginia Scott, who had joined the band early as a composer, was urgraded to a participant on ''Waters of change'', handling the Mellotron, while Alan Park was responsible for the piano and Hammond organ passages.Bassist Marshal Erskine participated in only one track of the upcoming album, leaving Beggars Opera and being replaced by Gordon Sellar.Famous engineer Martin Birch took his place behind the console and the album was recorded and released in 1971, the second of Vertigo albums for the band. Now, this was a pretty strange release by the Scottish group.Instead of stepping on the principles established by themselves on the Heavy/Classical Rock of ''Act one'' and building around this formula towards an even more personal style, they seem to take a trip back in late-60's/early-1970, resembling more to bands like THE MOODY BLUES or a more progressive PROCOL HARUM. 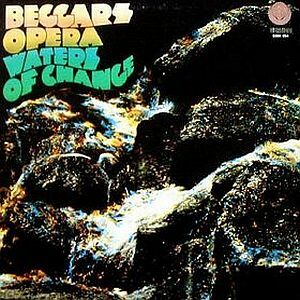 ''Waters of change'' sounds a bit directionless with the band throwing in strong psychedelic nuances in the process to go along with heavier sections and less Classical-inspired but more symphonic keyboard parts.Additionally the tracks sound less structured with a slight jamming mood of the early-70's organ-driven British Psych Rock bands.On the other hand, this is far from uninteresting music.Beggars Opera was a very talented act and they had their own way to combine Soft Psych Rock with a lyrical atmosphere with an organ-drenched Heavy Rock, the result was a bunch of compositions, which included romantic vocals, driving rhythms, smooth electric guitars and a more pompous organ execution, often interrupted by the atmospheric Mellotron waves of Virginia Scott.They sounded like a cross between DEEP PURPLE, CRESSIDA, early CARAVAN and THE MOODY BLUES at this point, combining a sentimental lyricism with the power of Rock music.There are still some great meodies to be found and the tracks contain nice variations, but the symphonic washes are less dominant with a vocal-based Psych/Prog style prevailing. Kind of dissapointing work after the impressive ''Act one'', but still a pretty cool album of early-70's Prog Rock, featuring a mixture of soft psych-oriented textures, organ smashes and symphonic overtones.Recommended.